Interpals has all you could need from a holiday camping site and more. Experience puppetry, juggling, pottery, and other shows at the open-air cinema. Dine at the on-site restaurant or grab a drink at the bar. Go for a bike ride through the pine forest, or take a dip and relax in the giant jacuzzi. 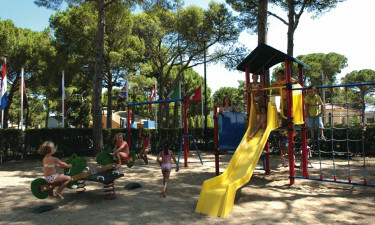 Interpals is less than 2km from a sandy beach and is in a prime location to explore more of the Costa Brava coastline. 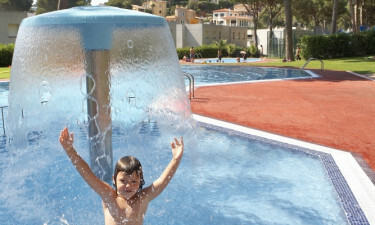 Interpals is a luxury camping site in Costa Brava. The region is famous for its gorgeous summer climate, world-class beaches, and surrounding sights of natural beauty. 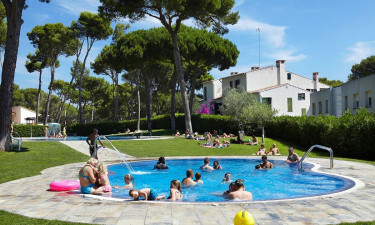 The holiday camping site is shaded by pine forests on a grassy hillside, and there's no lack of entertainment with an open-air cinema, mini adventure park, and plenty of sports facilities. The staff are happy to help you get the most of the area offering a bike rental service alongside maps of recommended routes. Spend your camping holiday day frolicking in the pool, and relaxing on the fresh grass that surrounds it. Take cover beneath the shade of tall pine trees or, if suitably cooled, melt into the Jacuzzi to experience camping luxury. The pool and the jacuzzi have unique water features and are illuminated by internal lights in the night-time. 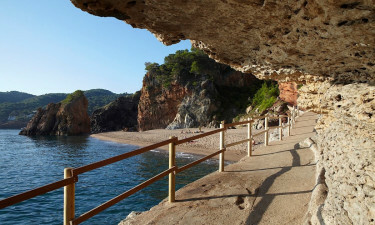 Costa Brava is renowned for its spectacular beaches, so it's well worth the time to spend at least a day there. The nearest beach is less than 2km away, and features a long stretch of golden sand, with crisp turquoise sea. Admire the view of the Medes Islands on the horizon, or go exploring in the nearby walled village of Pals.